JOPLIN, Mo. — It’s the single deadliest tornado to hit one town in the United States since 1953, according to the National Weather Service. At least 116 people were reported killed as of Monday evening, while thousands more remain homeless when a tornado hit this southwest Missouri town of Joplin on Sunday leaving a scene of massive devastation. Street block after street block, this town of about 50,000 people looked like a scene from a disaster movie and a horror flick combined, with houses crushed like playthings, huge trees uprooted from the ground and streets covered with every imaginable debris. This reporter came close to one of the worst-hit areas next to St. John’s Regional Medical Center. The multi-story building looked like it was hit by a bomb, its windows shattered all around. The residential area next to the hospital was completely flattened and rows of destroyed houses were left abandoned as if in a war-torn country. In one street corner, a roof of a house was cut in half. Nearby, several cars are crumpled and electric wires are strewn in the street. As this reporter surveyed the area Monday evening, lighting and thunderstorms continue thus hampering the rescue and recovery effort. It has been reported that at least two rescuers were hurt when lighting struck. President Obama, who is on an official trip to Europe, has spoken to Govenor Nixon, according to the White House. At Joplin’s Missouri Southern State University where over a hundred people were temporarily housed, Larry Daniel said he barely survived the tornado that struck the nursing home where he lives. At least 11 other seniors and a staffer were killed after being buried by wood and concrete from the collapsed building. “I am just happy to be alive,” Daniel said. “I thought I was gonna die.” Daniel, who showed signs of bruises in in face and arms, said he “crawled his way” from the debris. David James, a Red Cross volunteer said he was working at the local Target department store when the town’s alarm system went off warning about the coming tornado. There was not enough time to prepare, James said and all they had to do was huddle at one corner of the store. At the Holiday Inn, hotel attendant Suzette Lafond said that it was a miracle that her 4-year old grandchild Jayden Smith was found alive a mile away from their house, eight hours after the disaster. Back at Missouri Southern, Quinn Gardner of the AmeriCorps volunteer group said it is still too early to predict the total number of casualties, saying that hundreds are still being reported missing. Meanwhile, Angela Statton-Hunt, a Red Cross Coordinator said at least 3,000 volunteers have signed up for the rescue and recovery effort, as well as the humanitarian work at the evacuation centers. About 3,600 beds have been made available at Missouri Southern. In between sobs, Statton-Hunt recalled seeing the devastation immediately after the tornado strike. “I’ve had several friends that are personally affected,” she said. One friend’s house was completely destroyed, another friend’s son was finally founded being treated at the hospital. At the same time, Statton-Hunt praised the the survivors for trying to cope with the situation. The Joplin twister was one of 68 reported tornadoes across seven Midwest states over the May 21-22 weekend, according to the National Weather Service. According to media reports, it is a separate system from the storm that killed one person in eastern Kansas. A tornado also hit Minneapolis claiming one fatality. Already, the 2011 tornado season is the ninth deadliest on record. Only last April, 139 people were killed in three separate towns in Alabama. 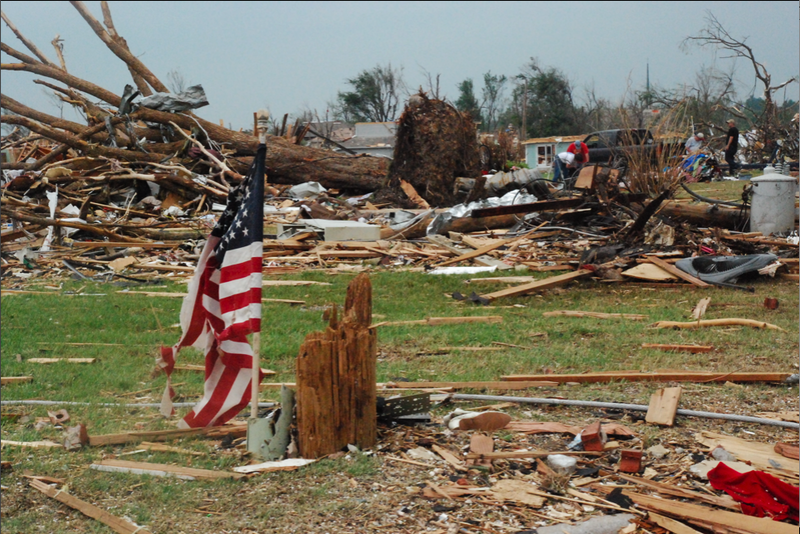 Over a hundred others were killed in neighboring Southern states bringing to 326 the total fatalities of those storms. In June 1953, the town of Flint, Michigan was hit by a deadly tornado that killed 116 people.